Now there’s scenario many music lovers are likely to be familiar with. Funny enough – though perhaps for the better – another genre that isn’t included in the above cliché response, yet is probably avoided with just as much haste, is opera. 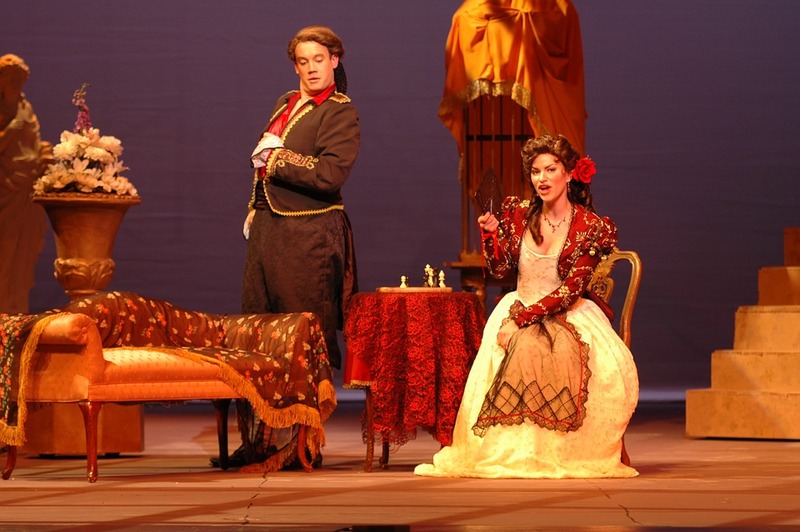 A style of music that dates back centuries upon centuries, spanning many countries, cultures, and emotional explosions, opera is stereotypically looked upon as a style of music and a kind of performance reserved for those in the upper classes of society. This generalization containing a grain of truth in music history and the hierarchies of early European societies, it’s not entirely surprising why the style has had to work much harder than its contemporary counterparts to connect with present day music fans. Thankfully we’re not in the 18th century anymore and there are many ways to engage with opera and opera singers without feeling like one has to study lots of musical scores or know five different languages beforehand. Many opera houses are creating programming and add-on initiatives to help roll out a welcome mat of sorts to new opera goers and below are just five of a plethora of ways you can peek behind the curtain without fear and judgement. Tis initiative by the New York City arts staple is a thriving example of creativity for embracing new fans. Among many other elements, part of what’s made opera feel inaccessible is the implication that one must look and behave a certain way when attending a performance. Everything from being unsure of what to wear and when to clap can make going to an opera seems daunting. That’s the beauty of the Met’s Live in HD program. Not in New York? No problem. Don’t have the budget for a house ticket? No problem. Don’t want to buy an expensive outfit and-or just like your jeans and sneakers? No problem! A select number of operas from the Met’s regular season are streamed live from New York City, to movie theaters all over the globe, as a high definition simulcast. That’s right. Your neighborhood movie theater is now an opera house – popcorn, candy, soda, and all. For a little more than the cost of a regular movie ticket, attendees can see very same show being performed on stage in New York (complete with subtitles), with the added bonus of behind the scenes views of the set changes and exclusive interviews with singers – sometimes right as they’ve stepped off stage! Read more HERE and find a local showing theater near you. Across the pond from the Met in New York, The Royal Opera House in Covent Garden, London, is a company similarly progressive stature when it comes to engaging with soon-to-be new opera lovers. Throughout the months of each regular season, the Royal Opera House prepares and presents a variety of programs separate from the performances themselves but equally as fascinating and meant to ultimately enhance the opera experience itself. Everything from beginner guides to the ROH’s operas, to talks with artists and producers before the shows, open rehearsals, and workshops, are offered to expand the world of opera beyond what people will see between the curtain rising and falling. Sometimes it’s just about getting know what it takes to make an opera happen, for the show to become exciting and appealing. It’s like getting access to a bunch of secrets and then understanding them in action. Topics of programming cover the likes of specific composers’ scores, opera stories in history, masterclasses with opera singers, and even a Christmas carol sing-a-long! Check out the programs for the 2017-18 season HERE. Let’s say you do find yourself intrigued by one of the many stories opera has to tell. After all, the tales are full of many things that comprise a good TV drama: love, lust, suspense, betrayal, sexual tension, and yes, even the occasional (okay, maybe more than occasional) murder. What’s a person to do with their internal excitement? Opera houses are becoming more accepting of expressiveness during performances but it’s true there’s still a level of expected restraint since, like any other live performance, you want to respect and not distract those on stage. However, The Greene Space, in downtown New York City, decided to give people a place to go, watch, learn, and laugh about many different facets of opera, with no restraint required. “The Opera Party,” a new series started in conjunction with New York radio station, WQXR, brings together the elegance of operatic performance with the fun and feasting expected in a late night cabaret club. Casual, and often funny commentary provided by Met singer and countertenor host, Anthony Roth Costanzo, fills the spaces between each of three performances and even with limited space, the show is accessible everywhere thanks to the internet and a good camera for live streaming. Toss in social media and the number of people at the party is suddenly limitless! Stay turned for updates about the series’ next season HERE. Not to overlook the other providers of great operatic talent in New York City, the New York City Opera collaborates with midtown Manhattan tourist hot spot, Bryant Park, to present performances of their own in the summer between program seasons. Similar to the Shakespeare in the Park programming presented by The Public Theater, NYCO at Bryant Park is an arts effort that was recently brought back to life, NYCO at Bryant Park sees their singers delivering awe-inspiring performances of iconic pieces from operas set for the upcoming next season. It’s a free event presented among the charm of one of New York’s most beloved public parks, without the seriousness of a dark opera house or the commitment of a multi-hour long show. Just as the songs are intended to be intriguing previews of the operas to come, this initiative is a great sampler for the kind of music someone new to opera can expect, before they’re in it for the long haul. And at only an hour, you’ve got time to squeeze in an aria before drinks at the bar! Keep up to date on the programming for next summer, HERE. Okay so, this is a bit of a cheat, since Sirius’s dedicated opera channel is partnered with the previously highlighted Metropolitan Opera. Nevertheless, this angle of access to the genre has benefits that differ from the Live in HD performance and is a key hub of exposure to the entire U.S., Puerto Rico and Canada. Admittedly, if one has never been into opera prior, simply turning the radio to a station that cranks out those loud, belting, vibrato-loaded voices is probably a method on the mildly intimidating side. The thing about Sirius XM’s 24/7, commercial free programming though, is that through its opera channel, listeners can come and go from the music as they please. Maybe listening to one new song a week is your beginner threshold. That’s fine. The music will still be chugging right along whenever you’re ready to come back. Beyond the aspect of anytime access, the knowledgable on-air DJs provide tidbits of history on key performances, artists and their careers, milestones for different shows, and more. There’s a sense of relief that comes from knowing a person can steadily learn about iconic figures and pieces of opera from the comfort of their home or car and if that means taking it nice and slow over a long period of time with the channel in your radio presets, then that’s how the show will go on! Find more information on Sirius XM and the Met Opera channel HERE. These are just a handful of programs and methods for dipping one’s toes into opera’s vast waters. There are educational outreach programs, free recitals, online broadcasts, artist interviews, and so much more, form opera companies everywhere in the world (shout out to the forever iconic Sydney Opera House and its fabulous programs. If it’s a matter of figuring out where to start, call up a friend! If the friend is an opera fan, getting to know the style through someone else can make the exploration feel less overwhelming. If none of your friends are into opera, maybe consider challenging them to explore it with you. Remember that there’s nothing wrong with being unsure and asking questions. The age of opera elitism is over. Opera is for everyone and if you’re wanting to give it a chance, your local opera company will undoubtedly welcome you with excited and open arms. A rash rush to pick(et)ing opera? Is “ENO” Short for ENOUGH with the Double Standard Against Arts Marketing?